The Ben Solowey Studio in Bedminster is a place that transports the visitor back in time to a past that both in social and aesthetic terms seems idyllic today. Solowey (1900-1978) was a painter whose studio-gallery stands as a tribute to his traditional skills and visions. Time travel in the studio’s current exhibition involves the summer and fall of 1924, which Solowey spent in Europe after graduating from the Pennsylvania Academy of the Fine Arts. 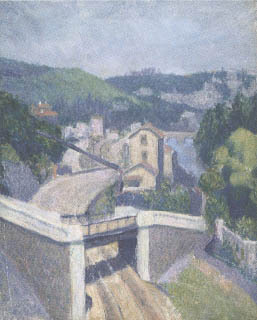 The intent is to demonstrate how the trip, especially the time spent in France, influenced Solowey’s subsequent painting style. The paintings and works on paper not only document the trip, they also bracket it works made before and after. Solowey, who earned fame for his drawings of theatrical personalities, was equally comfortable in all major paintings genres. On his European trip, however, he concentrated on landscape and city views. The heart of the show is a group of 27 small oil sketches, most on panel, that embody the impressionist touch to varying degrees. Solowey never completely succumbed to impressionism but adapted it selectively, as these paintings indicate. 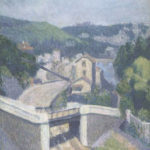 The paintings are mostly French scenes, including the obligatory view of Notre Dame, the Luxembourg Gardens, views along the Seine and a chateau. They are loose, brushy sketches that could have served as studies for studio compositions. Today, touring artists would probably make color slides. In each case, Solowey replicated the style of the original composition, while altering many of the details. The divergence between these borrowed styles and his own is striking, and it drives home the point that painting is, or was, as much a craft as an art.